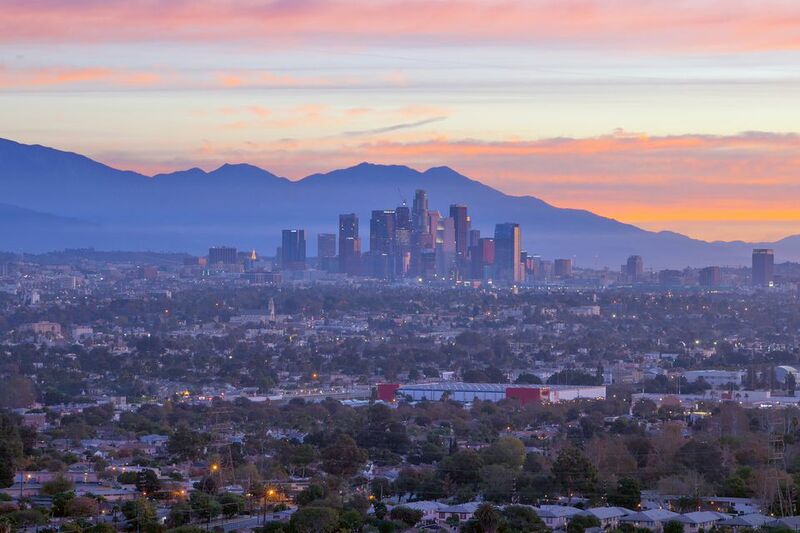 While car culture dominates Los Angeles, most of LA's main attractions are accessible via the LA Metro subway and over-ground train system. Of all the Los Angeles Metro lines, the Red Line has the highest density of attractions within walking distance. It's also the fastest since it's the only one that's all underground. This Metro Red Line tour will show you how to see some of LA's most famous sights and some lesser-known gems within an easy walk (or a little farther walk) of the Metro Stations. The entire line takes 29 minutes from Union Station to the North Hollywood Arts and Theatre District if you don't get off in between. The Downtown LA stations are so close together, with so many attractions in between, that you may find yourself walking from one station to the next rather than taking the train. Aside from the attractions, you can visit from the Metro Red Line, you can also take a free Art Tour of the Metro art installations. Union Station is the Downtown LA terminus of the Red Line. It connects you to Metrolink inter-city commuter trains and numerous bus lines as well as the Metro Gold Line to East LA and Pasadena. Right across Alameda Street from Union Station, you'll find El Pueblo de Los Angeles Historic Monument (Olvera Street), which includes LA Plaza museum of Mexican culture in LA, the Chinese American Museum ,and The Italian American Museum of Los Angeles in addition to its most popular feature, the Mexican Marketplace with its many vendors of Mexican imports and Mexican restaurants. To the right of El Pueblo from Union Station at Alameda and Main Street is the southeast corner of New Chinatown. The Chinatown Gate at Broadway is just a couple short blocks straight up Cesar Chavez Avenue, but it's 4 more blocks up to Chinatown Central Plaza. You can also take the Gold Line one stop from Union Station to the Chinatown Station, which is a block and a half from Chinatown Central Plaza. If you walk left out of Union Station, you'll be in Little Tokyo, where you'll find the Geffen Contemporary, a branch of the Museum of Contemporary Art and the Japanese American National Museum as well as numerous Japanese shops and restaurants. From the south end of Olvera Street at El Pueblo, you're just a block and a freeway overpass from LA City Hall, which is a little closer to the Civic Center Metro Station. The Civic Center Metro Station lets you off in the middle of the three-block expanse of Grand Park with exits toward City Hall (Broadway/Spring Street) at the bottom of the hill and exits toward the Music Center (Hill Street/Grand Ave) at the top of the hill. Grand Park itself has a small botanic garden, grassy areas, and benches as well as a large fountain at the top with a light show at night. Kids and adults cool off in the water in the summer. There's also a Starbucks near the foot of the fountain. The park hosts weekly outdoor yoga and various music events and festivals. The Los Angeles Music Center on Grand Avenue includes five performance venues, one of which is Frank Gehry's stunning Walt Disney Concert Hall. There are free tours of both the Disney Concert Hall and the main Music Center Campus. Next to the Disney Concert Hall heading south on Grand Avenue is The Broad, LA's newest museum of contemporary art, and across the street from that the main campus of the Museum of Contemporary Art (MOCA). Behind the MOCA and the Omni Hotel in California Plaza, an outdoor performance venue used by Grand Performances summer concert series. The Angels Flight funicular railway - when it's operational – travels one block from California Plaza down to Hill Street. There's a stairway adjacent to Angels Flight for when it's not operating. At this point, you're closer to the Pershing Square Metro Station. If you're heading for California Plaza, the Pershing Square Station is closer than Civic Center. Although Pershing Square itself is a block further south, there's an exit from the Metro station at 4th and Hill, a block below California Plaza. If Angeles Flight is running, you can catch a ride up the hill, otherwise, it's a steep walk up. Pershing Square is also the closest stop for Grand Central Market, which is across from the Hill Street end of Angels Flight. If you walk through Grand Central Market to Broadway, the Bradbury Building is across the street on the other side. Just a square brick building on the outside, the elaborate ironwork inside was inspired by a science fiction novel and has been used as a movie location in a number of films. This part of Broadway stretching several blocks south is known for the density of classic theatres, most of which are closed most of the time. A few are in use as clubs or churches, but they all open up for one night in January for Night on Broadway. If you exit the Pershing Square Station at 5th and Hill, you'll be at Pershing Square itself with its colorful geometric sculptures. Facing the square is the Millennium Biltmore Hotel. It's worth stepping inside to check out the ornate lobby and Gallery Bar. Pass Pershing Square and the Biltmore walking up 5th Street (or walk through the Biltmore) to reach the US Bank Tower, where you'll find OUE Skyspace LA with its 70th-floor Skyslide and Observation Deck. Down the block, The Standard hotel at Flower and 6th has one of the most famous rooftop bars in the city. The romantic Perch restaurant and bar, one of the Coolest Downtown LA Bars, is on Hill Street right across 5th Street from the Metro exit. On the south side of Pershing Square is the Jewelry District and a couple blocks east, centered around Spring Street, is Gallery Row, home to more than 50 art galleries, museums, theatres, and public art installations all within walking distance. The Downtown LA Art Walk takes place on Gallery Row on the 2nd Thursday of each month. 7th Street/Metro Center Station is the closest Red Line Station to the attractions at LA Live, about 5 blocks south. It's also the connecting station for the Blue Line or Expo Line, which both have a stop closer to LA Live and the Convention Center. This is the closest station to the Fig at 7th shopping center and food court, which you might find interesting if you're staying downtown and don't have a lot of options, but as far as shopping and eating go, it doesn't measure up to the larger malls and shopping options in Los Angeles. The Expo Line will take you past USC and the Exposition Park Museums and across town through Culver City to Santa Monica. The Blue Line will also get you closer to the LA Fashion District on the way south to Long Beach. The Westlake/Macarthur Park station is at Macarthur Park, where you'll find an interesting array of summer concerts at the Levitt Pavilion LA. Among numerous taquerias and other Mexican restaurants, another notable landmark at this stop is the original Langer's Delicatessen that has been open at this location since 1947. The Consulate General of Mexico in Los Angeles on the far side of Macarthur Park often hosts art and cultural exhibits, film screenings, ​and music events. If you're on the Red Line, you can relax and breeze through the Wilshire/Vermont Station. If you happen to be on the Purple Line, this is where you'll want to switch to the Red Line unless you're heading to the Wiltern Theatre, the Line Hotel or Normandie Hotel, or just want to embark on a deeper exploration of LA's vast Koreatown, which is about ten times the size of Chinatown. Architecture, local art, and sunsets are the features attractions at Barnsdall Art Park in Hollywood. The park at the top of Olive Hill features Frank Lloyd Wright's Hollyhock House, which you can tour for a fee, and the Los Angeles Municipal Gallery, which you can visit for free. The sunsets are also free. During the summer, the park hosts outdoor theatre and wine events. Another quirky attraction nearby on Hollywood Boulevard just east of Vermont (cross the street and turn right on Hollywood to the middle of the block) is La Luz de Jesus Gallery, a showcase for underground, counterculture art, and gifts. Unless you're looking for Thai or Armenian food, you can probably skip Hollywood & Western Station, although the Metro Station itself and adjacent tile apartment building form an interesting piece of public art. There are a few low-end tourist hotels in the vicinity. Hollywood and Vine is the second heart of Hollywood. You'll find the east end of the Hollywood Walk of Fame, the Capitol Records Building, views of the Hollywood Sign, the Pantages Theatre for Broadway shows, the Fonda Theatre for indie artist concerts, Avalon nightclub, and tons of other clubs, restaurants, bars, and hotels clustered right around this intersection. On Sunday mornings, it's the closest stop to the Hollywood Farmer's Market on Ivar north of Sunset, which is a good spot for people watching. Hollywood and Highland is the real heart of Hollywood with the most attractions clustered in a small area. The Metro Station is under the Hollywood & Highland Center, which includes a shopping mall, restaurants, the Dolby Theatre, Dave & Buster's and Hard Rock Café, and incorporates the adjacent Chinese Theatre and Madame Tussauds. It also houses the office of Starline Tours, and a number of other LA bus tours and walking tours depart from here. Some of the most popular stars on the Hollywood Walk of Fame are right out front, and you'll find costumed characters on the sidewalk ready to pose with you for tips. Immediately across the street, you'll find The Disney Entertainment Center, where Jimmy Kimmel, Live! is taped, El Capitan Theatre, which screens the latest Disney movies with live pre-shows and prop exhibits, and the Ghirardelli Soda Fountain and Disney Store. Cattycorner across the intersection of Hollywood and Highland, Ripley's Believe It Or Not is on the corner, with the Hollywood Museum in the pink Max Factor building next door on Highland. You can walk the three and a half long blocks uphill on Highland to the Hollywood Bowl, which has a museum you can visit during the day, or catch the shuttle from Hollywood & Highland. The Universal City Station is ​directly across from the Universal Studios Hollywood/NBC Universal complex. It's quite a long walk up the hill to Universal CityWalk and the theme park entrance, but there's a free shuttle from the Metro. The Red Line makes its final stop at the north end of the North Hollywood Arts and Theatre District at Lankershim and Chandler. There are a couple dozen small theatres within a few blocks of each other. Some have resident professional companies with full seasons of shows and others rent out to independent productions. With various discount entertainment programs, you can often see a live play in this neighborhood (and some others) for less than the cost of a movie ticket.